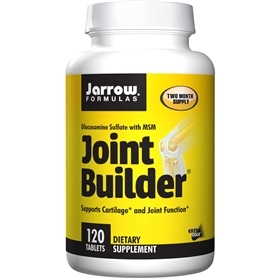 Jarrow FORMULAS Joint Builder is Joint Sustain nutrition, providing a SODIUM FREE form of GS stabilized with only potassium chloride (KCI). Take 2 tablets per day or as directed by your qualified health care consultant. Easy-Solv® tablets are designed to disintegrate within several minutes of ingestion. NOTE: DO NOT use if allergic to shellfish. If you have a medical condition, are pregnant, lactating, trying to conceive, or taking medications, consult your health care practitioner before using this product. Cellulose, stearic acid (vegetable source), curcumin, magnesium stearate (vegetable source), silicon dioxide and hydroxypropylmethylcellulose.